Background information on barley that is not necessarily found in other locations can be accessed from several websites and documents. Photo credit: David Hansen, University of Minnesota. Information on such topics as the historical development of barley as an agricultural crop, the anatomical structure of the barley plant, the demographics of barley production, barley genetics, and the various uses of barley are available through the following links. University of California Davis Sustainable Agriculture Research and Education Program. This site provides a complete crop summary of barley, including environmental and nutritional requirements, seeding information, maturity, uses, image gallery, production and storage recommendations, and other information. Gramene. Extensive resource for comparative grass genomics that includes specifics regarding barley anatomy, taxonomy, agronomy, research, education, and germplasm resources. Barley CAP. 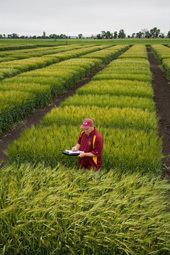 The Barley Coordinated Agricultural Project (CAP) is a community effort of scientists at diverse locations with expertise in genetics/genomics, breeding, pathology, databases, computer science, food science, malt quality, and statistics. GrainGenes. This site contains a variety of information including genetic maps, probes and primers, polymorphisms, trait scoring, disease symptoms, and mutant phenotypes. What's So Interesting About Barley? Background information developed by Barley Coordinated Agricultural Project, written by Peggy G. Lemaux. Funded by the USDA-National Institute of Food and Agriculture. Washington Grain Alliance Barley Facts page. Includes general information on barley history, production, and uses. National Barley Foods Council Industry Facts page. Provides background information on barley, where it is grown, and other information links. Barley Facts: Industry and Products. Fact sheet provided by the National Barley Foods Council, covering barley production, uses, and definitions. The Future of Barley. Report published in 2005 in Cereal Foods World 50: 271–277. This report summarizes research on bioactive compounds, beneficial effects, and sensory properties of barley.